Social Media Tailored SMT: WHO LEAD SOCIAL MEDIA IN BUSINESS SCHOOLS? This post starts a new series of quarterly statistics from the main Business Schools from Europe and North American and how do they incorporate Social Media into their overall communication strategy. This study includes thirteen business schools and four initiatives: Facebook, Twitter, YouTube and LinkedIn. Swiss School, IMD, leads Facebook and Linkedin with great distance from the rest ranking second from YouTube video views. On Twitter is Wharton Business School, University of Pennsylvania, who leads the ranking doubling its immediate follower the Spanish Business School: Instituto de Empresa. Stress the importance that its collective Alummni has for all Business Schools, with dozens of groups formed by the various training programs that teach and master. In this section Kellogg and Wharton from U.S. have the greatest number of students cluster around their main group with 18.593 and 18.522 students respectively. 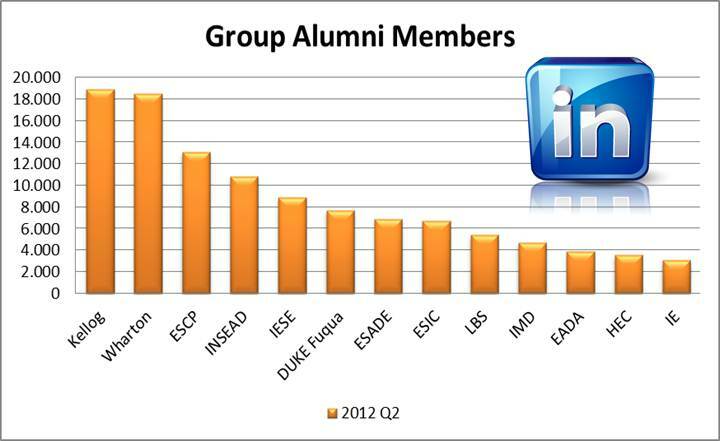 With more than 8,886 members, IESE alumni ranks first among the Spanish schools analyzed. 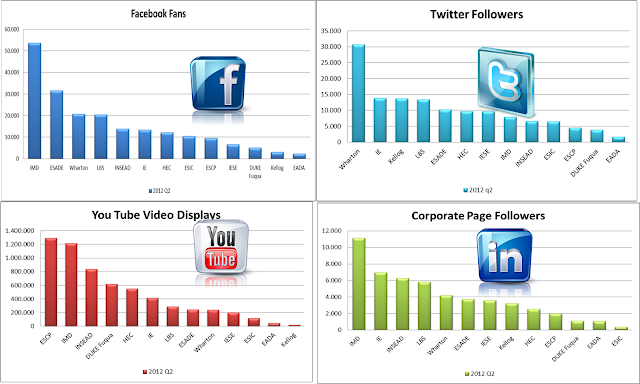 Finally some trending figures from October 2010 to June 2012, with spectacular growth in all the sites (see chart), confirming the importance that customers, in this case students and professionals give to socials networks as a communication channel with organizations.